Even office-based professionals may feel they’re losing that difficult balancing act between work life and social life. A subway ride to or from the office can turn the day into a marathon shift if you don’t turn off the internet on your smartphone. Sending emails, messaging with colleagues, making to-do lists for the day while on the go commuting or otherwise — everybody’s been there. Not to mention freelancers and remote team members who are more actively chasing the life-work balance dream. Such workers tend to find a comfortable place for work, rest, and communication. They might stay at home, rent a desk at a coworking space, or deposit themselves at the booth of a coffee shop. The tendency to blur work-life boundaries has also influenced how large companies operate. Today’s management crop has a different outlook on workflow than their predecessors – working at a company is not about work, it’s also about leisure. Employees enjoy upscale workplaces, conference and dining rooms, gyms, lounges, game rooms, movie theaters, and patios. And, because of all the perks, they probably won’t mind staying a couple hours longer if needed. In this regard, people are most likely to combine business and leisure when traveling for work. The chances they do so are even bigger if they take a few business trips per year, work overtime, or are not sure about having a decent vacation. Really, it would be a crime not to spend a couple of days on a beach or wander an unknown city’s streets after several days of negotiations. Those who agree with this statement and have a hard time choosing a future trip’s goal while filling in the search form on Booking.com can call themselves bleisure travelers. Bleisure is the travel trend of combining work commitments with entertainment. Having emerged nearly eight years ago, it continues to grow. Increasingly more people consider exploring new places while traveling for business. According to the latest survey by the education and research branch of the Global Business Travel Association (GBTA), 67 percent of North American business travelers thought it was important to add leisure to a trip in 2016. Thirty-seven percent of them did so. The trend can bring new opportunities to the travel and hospitality industry. Such trips require more thorough planning. For instance, someone will have to find a suite available for both weekdays and weekends, read about the area to schedule leisure activities, and book tickets to get home. In this situation, travelers could use help from OTAs, hotels, and other travel providers. This article explains who bleisure travelers are and how travel businesses can address their needs. You will find out how to spot potential bleisure travelers and motivate them to add personal days to a business trip. To understand if business travelers are motivated to extend their trip with leisure, you can analyze their behavior and the personal information they provide when looking for travel options. You can also rely on these complementary categories to offer a certain customer a deal he or she would likely accept. Trip time frame. US specialists from Expedia Media Solutions and Luth Research conclude that a trip lasting three or more days is 30 percent more likely to turn into a leisure one. They also report those who arrive at the destination on Monday-Tuesday or Thursday-Friday usually extend their stay. The closer the trip is to the weekend, the higher the probability of making it a bleisure trip. These customers first book airline tickets and then look for accommodations. Destination and route length. Sixty-six percent of travelers agree that destination matters. If a business meeting takes place in a city included in a traveler’s personal must-see list, he or she would likely extend a trip for a couple of days. When traveling internationally and for long distances, people expect to immerse in a different culture. 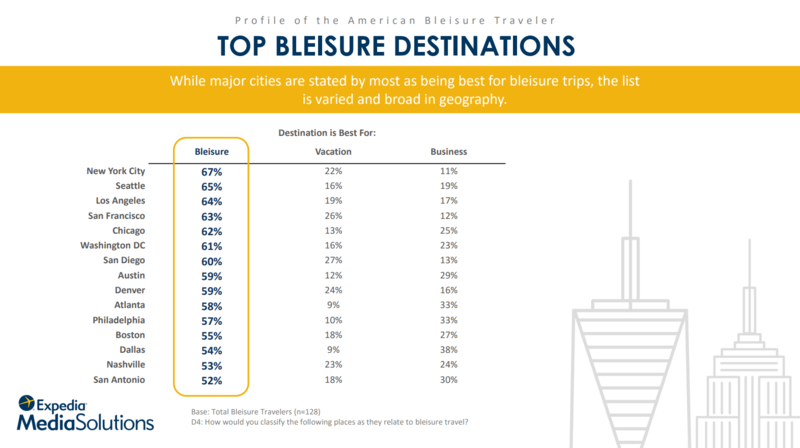 A higher bleisure rate for international (52 percent) over domestic (46 percent) trips proves bleisure attractiveness depends on a trip itinerary and an origin city. For instance, Londoners like visiting San Francisco (24 percent bleisure rate), and residents of the latter, in turn, enjoy the UK capital (23 percent bleisure). The relationship between longer distances and higher bleisure rates applies to domestic trips as well. Keep in mind, some destinations are better for business, and the others are great for vacation. In the survey by Expedia and Luth Research, major cities are rated according to bleisure attractiveness. Gender. The CWT survey leisure breakdown by gender indicates that men take more work-related trips than women (70 percent vs 30 percent). At the same time, analysts measured a higher bleisure rate for women (8.5 percent) than for men (6.8 percent) for the top 100 business destinations. The researchers explain this result by calculating an average annual number of bleisure trips per bleisure traveler. Turns out, it’s the same both for women and men (1.4). However, since women generally take fewer work-related trips than men, their bleisure rate is higher. Age category. Younger employees who have just started building careers are more adventurous than their experienced colleagues. According to the same GBTA report, 48 percent of surveyed millennials (aged 25 to 35) stayed for several days after having fulfilled their work commitments. The generation, which mostly follows the digital lifestyle and likely has no family-related responsibilities, is more flexible. The second largest group (33 percent) was generation X employees (36–54 years old). And only 23 percent of baby boomers said they took bleisure trips. Marital status. Some researches emphasize that having family and children isn’t a reason to reject taking a bleisure trip. Slightly more than half of business travelers (54.4 percent) surveyed by Bridgestreet Global Hospitality said they might take loved ones with them. Professional activity. Report stats on the correlation between leisure rates and trip frequency are different. The CWT travel survey summarizes that frequent travelers who take 20 trips per year or more are less than 5 percent likely to go on a bleisure trip. According to the report by Expedia and Luth research, bleisure travelers travel a lot: 32 percent of them take business trips once or twice a month, and 38 percent travels for work once every 2-3 months. Respondents of the GBTA research said they take nearly seven work trips per year. Although these employees work in various industries, most (26 percent) are related to technology. In general, they work full-time and earn nearly $79,000 per year, mostly occupying middle management positions (42 percent). You should focus on segmentation techniques to better understand your customer base, perhaps conducting your own research on how your business travelers behave. You can read more about specific segmentation techniques in our article about travel personalization and segmentation. “Destinations are the first research topic and lead decisions, with sightseeing and the restaurant scene being key influences,” representatives from Expedia and Luth Research highlight. The use of specific content and channels for its distribution can convince business travelers to spend extra days at the property for leisure activities. Every time you travel, you likely want to know everything about leisure options that your housing can offer. Your business travel customers aren’t an exception. They read about amenities, scroll photos, check out reviews, and attentively study a map to know if a location is good. Help them research destination fast and easy. If you run a hotel and already have a website, you can leverage direct bookings by providing additional information about hotel amenities, reservation details, and location. The Our Area section will give business travelers reasons to stay longer. 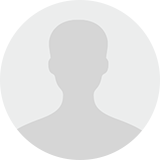 List sights, places for activities, wellness and shopping centers, restaurants, etc. Note their addresses, distance from the property, and contacts. Thirty-three percent of Expedia respondents said that there’s a high likelihood they’ll take a leisure trip if there is an event going on in the area. In that case, you can create an additional chapter for ongoing cultural and sporting events, concerts, or plays in the Our Area section. Airbnb offers their customers not only a search for properties but also a plan for their leisure activities. In the Experience section, homeowners advertise their own tours and workshops. A business traveler who finds out about out the multitude of exciting places located in walking distance from an accommodation usually stops thinking only about work. Social media presence allows for building a follower base. Communicate with it to share information about services. Facebook ranks first among the most efficient platforms for online marketing as 62 percent of digital marketers said they would choose it. Their choice is reasonable: More than 2 billion people actively use Facebook every month. Hilton’s Facebook page, for instance, has more than 1.7 million followers. Of course, the content on the hotel chain’s page is targeted at all groups of customers. But who said you can’t make posts for potential leisure travelers? For example, put up a photo of downtown Chicago, mention famous landmarks or upcoming events. You can also invite people to visit the destination, stay at the property, or use your site for booking. The social network offers a promotion option for business pages. Post boosting is one of them. Define a target audience based on such categories as location, age, gender, interests, as well as on insights about potential bleisure travelers noted above. You can also create a custom audience using contacts you already have or a lookalike audience based on people who’ve already shown interest in your page, as the Facebook team suggests. The GBTA and Expedia surveys found that most of the travelers (82-84 percent) stay at the same hotel or apartment for the bleisure part of their trip, which is a matter of convenience. The need to a research new area and book housing again, packing, unpacking, and moving to another place doesn’t seem like rest and relaxation for people who just have fulfilled important work commitments. How to encourage travelers to stay longer for their leisure part? According to the Expedia report, the most driving factors for accommodation change are high room rates (72 percent), an option to stay with family or friends who live in the area (58 percent), and a hotel’s significant distance from leisure activities (54 percent). You can make a price a reason to extend a stay at your property by offering a discount or extra nights. According to Colloquy Research, 76 percent of business travelers would gladly accept these offers. For example, a five-night deal with a 25 percent discount on the fourth night and the fifth night for free, or weekend rates with required Friday or Saturday stay over. Those travelers who have family or a significant other said they would make it a bleisure trip if a hotel offered the option to bring those people along at a discounted rate. Numbers from Expedia and Colloquy surveys differ in this case (44 and 76 percent respectively). You can offer a package in which children under 12 can stay for free, and the second adult gets a 20 percent discount per night. Bleisure perks can include a tour of local landmarks, discounted entry tickets to theme parks for traveler’s children, or gift cards for spa centers for couples. Please note that full-time employees usually plan professional trips at the beginning of the week. That’s why travel sites get most of their traffic on Mondays during normal work hours, between 9 am and 3 pm. The activity also rises after 8 pm and closer to the weekend. Knowledge of user digital behavior will help you understand when and how to deploy your marketing weapons. AARP research forecasted that 41 percent of travel bookings will be made online this year. Each month, more than 10 million travel-related searches are carried out in Google. Based on this number of searches, the top 10 OTAs receive approximately 3 million visitors in web traffic. Partnership with an OTA gives travel and sharing economy companies, hotels, and property owners an opportunity to reach a large audience of bleisure travelers who prefer planning trips by visiting the fewest number of sites. In other words, these companies can make a search path shorter and faster. But there are also specific options. By cooperating with travel management companies you can offer bleisure packages to travelers who work in companies that use travel management solutions. These solutions have a set of software development tools that allow for integrating their travel expense management with your hotel or OTA application. For example, Airbnb partners with Concur. The accommodation-sharing company introduced the Business Travel on Airbnb service to cater to the 10 percent of their patrons who are business travelers. Using the TripLink service, business travelers can book properties on Airbnb or other providers directly and have their expenditure reports automatically pre-populated in Concur. Airbnb shares bleisure deals though this service. Customers have an option to rent entire houses using Business Travel Ready search filter. Employees can work and relax at the same place and live like locals in their new neighborhood. American Airlines has sealed deals with 21 hotel groups to develop its loyalty program. Travelers who fly with the airline can earn miles in exchange for staying in hotels. They can choose from dozens of properties, including ones by such major hotel groups as Hilton Worldwide Holdings, InterContinental Hotels, Marriott, Hyatt Hotels and Resorts, and Starwood Hotels and Resorts. The reward a traveler gets depends on the hotel they have chosen. For example, you can win 500 miles for each stay in Hyatt hotels. Nevertheless, the biggest bonus — up to 10,000 per night — is offered to customers who book hotels on Rocketmiles OTA. So, people traveling for work can extend their stay for the money they saved on a flight home. API stands for application programming interface. It’s a software that allows for delivering a request to travel service providers about their booking capacities and receiving a response from them. In other words, travel APIs provide instant access to services of third-party vendors. With an integrated API, you can make targeted suggestions to visit landmarks or attractions available in the area and even give travelers an option to book them right from your website. Give business travelers ideas on how to spend free time after they’re done with work. You can use a travel booking API to create personalized offers and promote them through notifications in mobile applications or emails. Such APIs as Expedia Things To Do or Viator return results on requests for activities, events, and tours available in the area for the chosen dates and locations. Knowing where your customers go on a business trip, you can suggest them experience the local cuisine. Make tailored suggestions to reserve tables at a destination’s best restaurants or pubs for groups or single travelers. For instance, you can use Open Table APIs to streamline table booking at the nearest eateries. A change of corporate culture within companies that brings flexibility to work life has made bleisure a commonplace practice for business travelers. People won’t miss an opportunity for stress relief and exploration of a new destination. According to new research by Booking.com, 30 percent of employees admit they would even take a lower paying position if it guarantees they could travel more for business. The new breed of employee who aims to maintain a balance between work and leisure will keep this trend alive and flourishing.